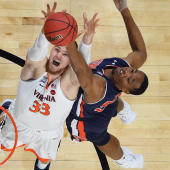 Josh Nagel is on a hot streak on his college basketball picks against the spread. The No. 9-seeded Clemson Tigers will take on the No. 8-seeded NC State Wolfpack in the second round of the 2019 ACC Tournament on Wednesday at noon ET. Both teams are on the bubble according to CBS Sports bracketology guru Jerry Palm's latest projections, with Clemson listed as one of the last four teams in and NC State needing lots of help to make the NCAA Tournament bracket. Given the drama of the last meeting between these two teams, a 69-67 NC State win, it should be an intense battle at the Spectrum Center in Charlotte. The Tigers are favored by 1.5 in the latest Clemson vs. NC State odds, while the over-under, or total number of points Vegas believes will be scored, is 143.5, up from an open of 140. Before you make your Clemson vs. NC State picks, be sure to see the predictions from the proven computer model at SportsLine. A Nevada-based expert and winner of multiple handicapping contests with more than 20 years of experience in the sports wagering industry, Nagel specializes in picking college athletics. He is entering Wednesday with a sparkling 42-27 record in against-the-spread college basketball picks for SportsLine members. Anyone who has followed him is way up. Nagel knows that NC State will be looking to recapture the magic of its late-January win over Clemson. The Wolfpack hit big shots down the stretch, including a Braxton Beverly 3-pointer as time expired to win 69-67. The Wolfpack have been a streaky shooting team all season, hitting 36.1 percent of their 3-point attempts for the season. They're 9-1 in games where they hit at least 10 shots from beyond the arc. But just because the Wolfpack can shoot doesn't mean they'll cover the Clemson vs. NC State spread in the 2019 ACC Tournament on Wednesday. The Tigers shot the ball better from the field (49 percent to 44.4 percent), out-rebounded NC State on both ends of the floor (33-26), and held a six-point lead with just 30 seconds left before falling down the stretch earlier this season. And Clemson has hunkered down defensively, while NC State infamously scored 24 points against Virginia Tech in February. Look for a Clemson squad that has held its last five opponents to 37.3 percent shooting to attack NC State's guards and take them out of their flow. And NC State isn't likely to have the luxury of another lackluster 5-for-17 shooting night from Clemson's leading scorer, Marcquise Reed, again. We can tell you Nagel is leaning toward the over, but his much stronger play is on the spread. He has identified a critical x-factor that causes one side of the spread to hit hard. He's only sharing what it is, and who to back, at SportsLine. Who wins NC State vs. Clemson? And what critical x-factor makes one side of the spread a must-back? Visit SportsLine now to find out which side of the North Carolina State vs. Clemson spread you need to jump all over Wednesday, all from a senior analyst who has hit 60 percent of his recent college basketball spread picks.